Our planet is fast evolving from a natural setting for human settlement toward a world where urban settlement itself is the primary ecological system. As this evolution occurs, design of the built environment, especially in cities, is becoming increasingly complex and vitally important to all aspects of our daily lives. For four decades, Hames Sharley has dedicated itself to the creation of design value on every project for every client. All the knowledge gained, research undertaken, protocols developed and options evaluated have been directed toward achieving the optimum outcome for project stakeholders. We are committed to creating places and buildings that will inspire and delight users, owners and visitors. The creative value of a building or place evolves from a unique shared vision that provides the foundation of every project. Through knowledge and research, we challenge preconceptions and conventions to effectively use resources and technology, and provide better living, working, learning and health outcomes that add strategic value to our projects and therefore to our clients. We believe a place or building acquires meaning through translating specific client aspirations while also recognising those of the broader community. Interpreting site, climate, community, culture and social behaviour is critical to design that enhances its setting and reflects current social values and ideas. 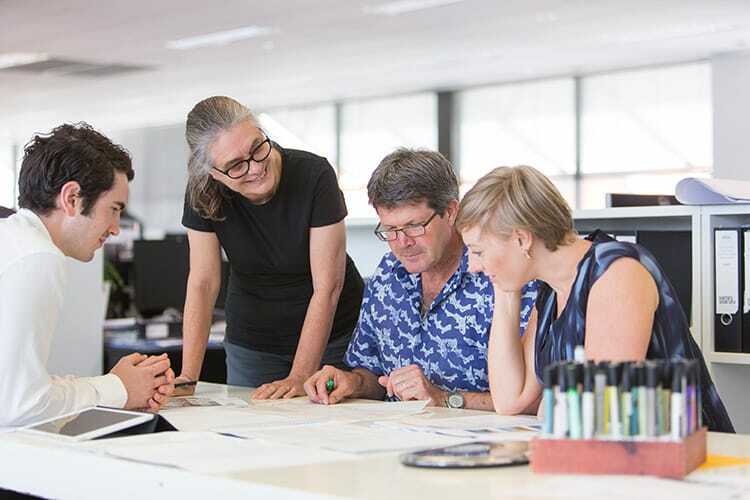 We encourage inclusive and challenging dialogue within our project teams and beyond into our multi-disciplinary studio practice. This dialogue also involves our clients, and other stakeholders and consultants with whom we build ongoing relationships. We consider ‘whole of life’ costs, maintenance and return on capital as integral to successful design. Through our focus on asset value, Hames Sharley have demonstrated that we can significantly enhance the long-term investment outcomes for our clients. Hames Sharley aims to develop the ideas and aspirations of our clients with skill and integrity and create pragmatic solutions that are not only structurally and formally innovative but are reflective of our commitment in realising the full potential of every project. Our design philosophy encourages the creation of environmentally and socially appropriate solutions that reflect our ambitions to deliver the best product to our clients and live up to our responsibilities in creating the future built environment that we all share. We engage the knowledge and experience of our entire project team and encourage collaboration both within Hames Sharley and with sub-consultants and specialists. This process ensures that the final design is a considered, intelligent and creative reflection of the brief and the needs of the client.